In just a few short days, AGBU’s 87th General Assembly will begin in Armenia, and excitement is already mounting for the host of cultural and social events that the week will bring. On Saturday, October 13, 2012, Yerevan will welcome hundreds of AGBU delegates and friends from across the diaspora. Many will kick off their stay with a two-day group visit to Karabakh on Sunday, October 14, and many more will attend an AGBU-sponsored concert on Wednesday, October 17 at the TUMO Center for Creative Technologies in Yerevan. The TUMO Center, initiated by AGBU Central Board member Sam Simonian and his wife Silva, was unveiled just one year ago. Since then, it has established itself as the city’s premiere institute for media studies, designed to serve over 1,000 students a day. It is the ideal venue for the open-air concert featuring the TUMOrchestra and the popular rock band, Dorians, whose debut album, “Fly,” has topped the charts in Armenia. The outdoor event, which is free and open to the public, is scheduled to start at 8pm, and an after party with DJ Serjo is sure to carry the festivities well into the night. If you are in Armenia next week, don’t miss this much-anticipated event! For years, they’ve been listening to and playing recordings of their favorite musicians, and this summer, a select group of up and coming artists got the chance to play right alongside those performers who have inspired them. Collaborating with top Armenian musicians is just one of the many exciting activities that the Musical Armenia Program (MAP), AGBU’s latest initiative geared toward youth and young adults, has to offer. Yet another AGBU ensemble has been invited by the Diaspora Ministry to perform in the “My Armenia” festival happening this summer in Yerevan. 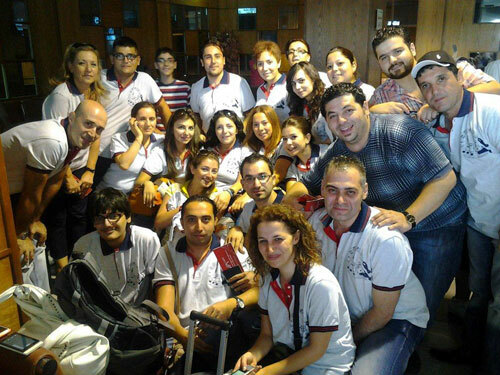 Just this morning, Aleppo’s AYA Spendiarian Choir posed for a fun group photo before getting on the plane. They will spend one week in Armenia sharing their talents on stage and touring important sites. We wish them the best! Hundreds of non-Armenians recently had the unique opportunity to experience Armenian music in the heart of historical Paris, thanks to a concert by the city’s AGBU Koghtan Choir. On March 20, 2012, the choir, led by Haig Sarkissian, together with La Clef des Chants Ensemble, directed by Benoît Reeves, drew a diverse crowd of over 400 to the Refectory of the Cordeliers. There, they enjoyed an evening of both classical and modern performances, as well as poetry readings.